Microglia are resident macrophages of the central nervous system (CNS) locally maintained through colony-stimulating factor 1 receptor (CSF1R) signaling. Microglial depletion via CSF1R inactivation improves cognition in mouse models of neuroinflammation, but limits virologic control in the CNS of mouse models of neurotropic infections by unknown mechanisms. We hypothesize that CSF1R plays a critical role in myeloid cell responses that restrict viral replication and locally restimulate recruited antiviral T cells within the CNS. The impact of CSF1R signaling during West Nile virus infection was assessed in vivo using a mouse model of neurotropic infection. Pharmacological inactivation of CSF1R was achieved using PLX5622 prior to infection with virulent or attenuated strains of West Nile virus (WNV), an emerging neuropathogen. The subsequent effect of CSF1R antagonism on virologic control was assessed by measuring mortality and viral titers in the CNS and peripheral organs. Immune responses were assessed by flow cytometric-based phenotypic analyses of both peripheral and CNS immune cells. Mice treated with CSF1R antagonist prior to infection exhibited higher susceptibility to lethal WNV infection and lack of virologic control in both the CNS and periphery. CSFR1 antagonism reduced B7 co-stimulatory signals on peripheral and CNS antigen-presenting cells (APCs) by depleting CNS cellular sources, which limited local reactivation of CNS-infiltrating virus-specific T cells and reduced viral clearance. Our results demonstrate the impact of CSF1R antagonism on APC activation in the CNS and periphery and the importance of microglia in orchestrating the CNS immune response following neurotropic viral infection. These data will be an important consideration when assessing the benefit of CSF1R antagonism, which has been investigated as a therapeutic for neurodegenerative conditions, in which neuroinflammation is a contributing factor. West Nile virus (WNV) is an emerging human pathogen that causes seasonal outbreaks through the Western hemisphere since its introduction in 1999 . A member of the Flavivirus genus, WNV is an enveloped, single-stranded positive sense RNA virus that cycles between birds and mosquitos. Symptoms of WNV infection can range from a relatively mild flu-like illness, West Nile fever, to severe neuroinvasive disease. After peripheral infection, WNV replicates within lymphoid tissues before entering the CNS, where it targets neurons in the cerebellum, brainstem, and cerebral cortex [2, 3]. In 2017, 2002 symptomatic WNV cases were reported to the CDC, and of those, 1339 (67%) were classified as neuroinvasive . Prolonged neurological deficits, which include motor functions, verbal learning and memory, and executive functions, are a significant problem for survivors of WNV infection and appear to manifest even in cases where neuroinvasion is absent [5–7]. Recent work indicates that persistent phagocytic microglia contribute to prolonged cognitive dysfunction following WNV encephalitis , and thus, limiting microglial activation may alleviate the associated neurological sequelae. Microglia are the resident immune cells in the CNS, originating from yolk sac progenitor cells that seed the brain early in development . In addition to a multitude of homeostatic functions throughout development and healthy aging [10, 11], microglia participate in both innate and adaptive immune responses through recognition of pathogen-associated molecular patterns and damage-associated molecular patterns , which stimulate morphological changes [13, 14] and increase production of reactive oxidative species [15, 16] and cytokines/chemokines [17, 18]. During neurotropic virus infection, virally infected cells secrete chemokines including CCL2, CCL5, and CXCL10, which facilitate immune cells crossing the blood brain barrier (BBB) [19–21]. Mononuclear cell infiltration into the CNS is a hallmark of WNV encephalitis, and monocytes and T cells are critical for CNS virologic control. Elimination of monocytes using a liposome-encapsulated drug dichloromethylene diphosphonate or by genetic deletion of CCR2 increases mortality in mice infected with a neurotropic strain of WNV [22, 23]. However, monocytes may also contribute to dissemination of virus to the CNS [24, 25], and inhibition of monocyte infiltration may also protect against nitric oxide-mediated immunopathology . 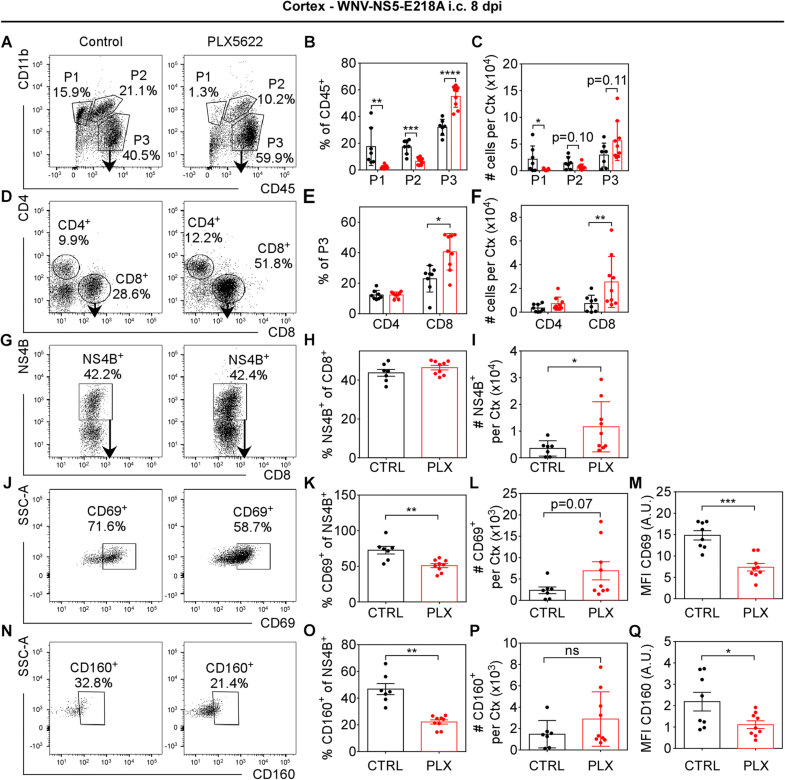 CD4+ T cells produce antiviral molecules, such as interferon γ (IFNγ) and IL-2, which promotes antiviral humoral immunity and sustains WNV-specific CD8+ T cell responses, enabling viral clearance in all organs [27, 28]. CD8+ T cells contribute to viral clearance and recovery from WNV infection via both cytopathic and noncytopathic mechanisms [29–32]. Mice lacking either CD8+ T cells or MHC-I molecules have higher CNS viral burdens, increased mortality after infection, and prolonged viral persistence, suggesting that cell-mediated immunity controls virus within the CNS . CSF1 receptor (CSF1R) signaling is essential for the development of many mononuclear phagocytes including microglia. Tissue-resident macrophages, such as microglia, fail to develop in Csf1r−/− mice , but in contrast to many tissue macrophages, adult microglia can still form in Csf1op/op mice, which carry a natural null mutation in the Csf1 gene . This is due to an alternative CSF1R ligand, IL-34, which is highly expressed by neurons [34, 35]. Similar to Csf1op/op mice, IL-34−/− mice develop fewer microglia but do not lack peripheral macrophages . These mice are more susceptible to lethal neurotropic WNV infection, which is associated with increased neuronal apoptosis without increased viral replication . In order to temporally control microglial depletion, pharmacologic agents that antagonize CSF1R have been developed, including antagonist PLX5622, which depletes microglia in as little as 3 days and may be sustained for at least 6 weeks . These agents are being investigated as therapeutics in models of neurodegenerative diseases in which microglial activation is considered a contributing factor, such as traumatic brain injury [38, 39], experimental autoimmune encephalomyelitis , and Alzheimer’s disease . Here, we used PLX5622 in a model of WNV encephalitis to examine the effect of CSF1R antagonism in the setting of neurotropic viral infection. Our results show that mice treated with PLX5622 are more susceptible to lethal WNV infection, which is associated with increased CNS viral burden and neuronal apoptosis. PLX5622 also reduced expression of proinflammatory cytokines and B7 co-stimulatory molecules within the infected CNS by depleting cellular sources, including resident microglia and infiltrating macrophages, as well as decreasing expression on peripheral antigen-presenting cells (APCs). The loss of APCs in the CNS resulted in limited local reactivation of recruited antiviral CD8+ T cells, which are required for virologic control in the CNS. Together, these data demonstrate the impact of CSF1R antagonism on APC activation during viral infection in both the CNS and periphery and highlight the importance of microglia in orchestrating cell-mediated antiviral immunity during neurotropic infection. All experiments were performed in strict compliance with the recommendations in the Guide for the Care and Use of Laboratory Animals of the National Institutes of Health and according to the international Guiding Principles for Biomedical Research Involving Animals. The protocol was approved by the Washington University School of Medicine in St Louis Animal Safety Committee (#20170064). WNV-NY is strain 3000.0259, isolated in New York in 2000  and passaged twice in C6/36 Aedes albopictus cells to generate an insect cell-derived stock for f.p. inoculations. For i.c. inoculations of WNV-NY, virus strain 3000.0259 was passaged once in Vero cells to generate mammalian cell-derived stock. Attenuated WNV-NS5-E218A was constructed from WNV 3356 strain as described previously [43, 44] and was passaged once in Vero cells, as described previously . Stock titers for all viruses were determined using BHK21 cells for viral plaque assay as previously described . All mice used in these experiments were male C57BL/6 inbred mice obtained commercially (The Jackson Laboratory). All mice were housed in pathogen-free facilities at the Washington University School of Medicine. PLX5622 was provided by Plexxikon Inc. and formulated in AIN-76A rodent diet at a dose of 1200 mg/kg by Research Diets. Mice were provided PLX5622 or control AIN-76A chow starting at 6 weeks of age for 2 weeks. For viral inoculations, mice were anesthesthetized with a cocktail of ketamine/xylazine/acepromazine, then inoculated subcutaneously via footpad injection (f.p., 50 μl) or intracranially (i.c., 10 μl) with a guided 29G needle into the brain’s third ventricle. For in vivo virus replication experiments, mice were infected with WNV and euthanized at specific days post-infection, as indicated. For tissue collection, mice were deeply anesthetized with ketamine/xylazine/acepromazine, blood collected in serum separator tubes, then transcardially perfused with sterile Dulbecco’s phosphate-buffered saline (dPBS; Gibco). The spleen and kidneys were collected, then the brain and spinal cord removed and microdissected. All organs were snap frozen, weighed, and then homogenized in dPBS. Virus was titered by standard plaque assay with BHK21 cells, as described previously . Serum viremia was measured using TaqMan quantitative RT-PCR (qRT-PCR) primers and probe listed in Table 1, as described previously . For flow cytometry experiments, mice were deeply anesthetized with ketamine/xylazine/acepromazine, then blood was collected in 5 μM EDTA in dPBS (Gibco). Mice were transcardially perfused with dPBS, and then, the spleen, brain, popliteal LNs, and femur were removed. Bone marrow was collected from the femur by centrifuging the bone in a 0.65-ml microtube punctured with an 18G needle nested inside a 1.7-ml tube. Brain tissue was minced and digested in a HBSS (Gibco) containing 0.05% collagenase D (Sigma), 0.1 μg/ml TLCK trypsin inhibitor (Sigma), 10 μg/ml DNase I (Sigma), and 10 mM Hepes pH 7.4 (Gibco) for 1 h at 22 °C with shaking. Brain, spleen, and LN tissues were pushed through a 70-μm strainer and centrifuged at 500g for 10 min. Brain cell pellets were resuspended in 37% isotonic Percoll (GE healthcare) and centrifuged at 1200g for 30 min to remove myelin debris, and pellet was resuspended in dPBS. Red blood cells were lysed in blood, spleen, and bone marrow samples with ACK lysing buffer (Gibco) for 5 min, then centrifuged at 500g for 10 min and resuspended in dPBS. Prior to immunostaining, all cells were blocked with 1:50 TruStain FcX anti-mouse CD16/32 (Clone 93, Biolegend, Cat 101320) for 5 min. Cells were stained with antibodies, as indicated for 15 min at 22 °C, then washed thrice with dPBS, and fixed with 2% paraformaldehyde (PFA). Data were collected with a BD LSR Fortessa X-20 flow cytometer and analyzed with FlowJo software. All used at 1:200: CD11b (Clone M1/70, Biolegend, Cat 10137), CD45 (Clone 30-F11, eBioscience, Cat 56-0451-82), MHCII (Clone M5/114.15.2, Biolegend, Cat 107626), CD86 (Clone GL1, BD Biosciences, 553691), CD80 (Clone 16-10A1, Biolegend, 104706), CD11c (Clone N418, Biolegend, Cat 117335), CD103 (Clone 2E7, eBioscience, Cat 48-1031-80), CD8a (Clone 53-6.7, Biolegend, Cat 100712), CD4 (Clone RM4-5, BD Biosciences, Cat 550954), CD69 (Clone H1.2F3, eBiosciene, Cat 12-0691-81), Ly6C (Clone HK1.4, Biolegend, Cat 128003), Ly6G (Clone 1A8, Biolegend, Cat 127616), CD160 (Clone 7H1, Biolegend, Cat 143007), Rat-anti-P2RY12 (Clone S16007D, Biolegend, Cat 848002), and Goat-anti-Rat-AlexaFluor 350 (Invitrogen, Cat A21093). WNV-specific CD8+ T cells were identified with fluorescent-labeled immunodominant Db-restricted NS4B peptide. RNA was isolated from tissue homogenates using Qiagen RNeasy kit according to the manufacturer’s instructions. RNA was treated with DNAse, then cDNA was synthesized using random primers and MultiScribe reverse transcriptase (Applied Biosystems). A single reverse-transcriptase master mix was used to reverse-transcribe all samples in order to minimize differences in reverse-transcription efficiency using the following conditions: 25 °C for 10 min, 48 °C for 30 min, and 95 °C for 5 min. For all primers except WNV, qRT-PCR was performed using Power SYBR Green PCR mastermix, and data are reported as ΔCt (Cttarget − CtGAPDH). Viral RNA was isolated from serum using Qiagen Viral RNA kit. A standard curve of viral genome with known PFU and serum samples were quantified using TaqMan reagents and the primers and probe listed in Table 1. Following perfusion with ice cold PBS and 4% paraformaldehyde (PFA), brains were immersion-fixed overnight in 4% PFA, followed by cryoprotection in two exchanges of 30% sucrose for 48 h, then frozen in OCT (Fisher). Ten-micrometer sagittal sections were cut, then washed with PBS, and permeabilized with 0.1% Triton X-100/0.1% sodium citrate. Tunel reaction was prepared according to the manufacturer’s directions (Roche in situ cell death kit, TMR Red, Cat 12-156-792-910). Sections were immunostained for NeuN or Iba1 by blocking sections with 5% goat serum/0.1% Tween 20/PBS, then incubating overnight at 4 °C with rabbit-anti-NeuN (1:1000, Clone D3S3I, Cell Signaling Technology Cat 12943S) or rabbit-anti-Iba1 (1:1000, Wako Cat 019-19741). Sections were washed with 0.1% Tween 20/PBS, then incubated with goat-anti-rabbit-AF488 (4 μg/ml, Invitrogen, Cat A11008), counterstained with 1 μg/ml DAPI, and coverslipped with Prolong Gold Antifade Mountant (ThermoFisher, Cat P36930). Z-stack images (seven images separated by 1 μm) were captured using a Zeiss LSM 510 laser-scanning confocal microscope at × 40 objective magnification then compressed into a maximum intensity projection with accompanying software. For each region of each mouse, three to six images were taken from two different sagittal sections spaced at least 50 μm apart. The number of DAPI-positive nuclei also positive for NeuN and Tunel were counted by an individual blinded to the conditions. Statistical analyses were performed using Prism 7.0 (GraphPad Software). All data were analyzed using an unpaired t test or two-way ANOVA with Sidak’s post-test to correct for multiple comparisons, as indicated in the corresponding figure legends. A P value < 0.05 was considered significant. CSF1R signaling is essential for the development of mononuclear phagocytes including microglia, but pharmacological antagonism has been reported to selectively deplete microglia . To examine the impact of CSF1R antagonism on both peripheral and CNS mononuclear cells, we used PLX5622, which reportedly depletes microglia in as little as 3 days and may be sustained for at least 6 weeks [37, 41]. Mice were provided either control chow or PLX5622-embedded chow for 2 weeks, after which microglia numbers were assessed by flow cytometry using the microglia-specific marker P2RY12 (Additional file 1) and by immunohistochemistry using Iba1 (Additional file 2). Quantification shows that 2 weeks of PLX5622 treatment reduced microglia in the CNS by 90–95% (Additional file 1 A–F, P, Q). Specificity of P2RY12 for CNS-resident microglia is demonstrated by lack of staining in leukocytes isolated from peripheral immune compartments (Additional file 1 G–O). Within the CNS, PLX5622 treatment significantly depleted microglia across hippocampal, cortical, and cerebellar brain regions (Additional file 2). To determine whether PLX5622 treatment depleted mononuclear cells in peripheral immune compartments, we assessed numbers of antigen-presenting cells (APCs, Fig. 1) and T cells (Additional file 3) in the spleen and blood of uninfected mice in control versus PLX5622-treated mice. PLX5622 treatment significantly reduced circulating CD11c+ (Fig. 1a–c), MHCII+CD11c+ (Fig. 1d–f), and CD11bnegCD11c+ (Fig. 1g–i) cells in the blood. In the spleen, however, there was no significant difference in populations of APCs with PLX5622 treatment (Fig. 1j–r). In addition, no significant difference in populations of T cells was detected in uninfected mice in either compartment (Additional file 3). Because of the sensitivity of microglia and APCs to CSF1R antagonism, we assessed whether CSF1R antagonism depleted CD11b+, Ly6C+, and Ly6G+ cells in the blood, spleen, and bone marrow of PLX5622-treated versus control-treated uninfected mice. Flow cytometry analysis revealed no significant differences in populations of these cells in uninfected mice (Additional file 4). Together, these data indicate that circulating APCs, but not bone marrow or splenic mononuclear cells, are decreased in the context of CSF1R antagonism. CSF1R antagonism reduces circulating APC populations in uninfected mice. Mice were fed PLX5622 chow or control chow for 2 weeks, and APCs were assessed in blood (a–i) and spleen (j–r). a, j Representative flow cytometry plots of CD11c expression on CD45+ cells. b, k Quantification of percentages and c, l total numbers of CD45+CD11c+ cells. d, m Representative flow cytometry plots of MHCII expression on CD11c+CD45+. e, n Quantification of percentages and f, o total numbers of MHCII+CD11c+CD45+ cells. g, p Representative flow cytometry plots of CD103 vs CD11b expression on CD11c+CD45+ cells. h, q Quantification of percentages and i, r total numbers of (I) CD103+CD11bnegCD11c+CD45+, (II) CD103+CD11b+CD11c+CD45+, (III) CD103negCD11b+CD11c+CD45+, and (IV) CD103negCD11bnegCD11c+CD45+ cells. For quantification panels, each symbol represents an individual control (black) or PLX5622-treated (red) mouse, and bars indicate mean ± SEM. Data shown represent analysis from one experiment with three to five mice per group, repeated in three independent experiments. Statistical significance was calculated using two-way ANOVA with Sidak’s multiple comparisons test. For all data: ns, not significant at P < 0.05; *P < 0.05; **P < 0.01; ***P < 0.001. To determine whether CSF1R antagonism impacts survival from WNV infection, mice were fed PLX5622-embedded chow for 2 weeks, then infected with WNV-NY  at either 102 or 104 PFU via footpad (f.p.) inoculation. Consistent with published data [8, 49], 30% of control-treated mice survived infection with 104 PFU and 90% of control-treated mice survived infection with 102 PFU; however, mice treated with PLX5622 universally succumbed to infection with either inoculum titer (Fig. 2a). This was associated with significantly increased weight loss (Fig. 2b) and more severe clinical score (Fig. 2c, d) in PLX5622-treated compared with control-treated mice infected with 102 PFU WNV-NY. To determine whether increased mortality caused by PLX5622 treatment is associated with increased viral replication in peripheral or CNS tissues, tissue viral loads were assessed by plaque assay, and serum viral loads were determined by quantitative RT-PCR (qRT-PCR) at 2, 4, 6, and 8 days post-infection (dpi). In the CNS, virus was first detected in the olfactory bulb (Fig. 2e), then sequentially in more caudal regions including the cortex (Fig. 2f), cerebellum (Fig. 2g), brainstem (Fig. 2h), and spinal cord (Fig. 2i). 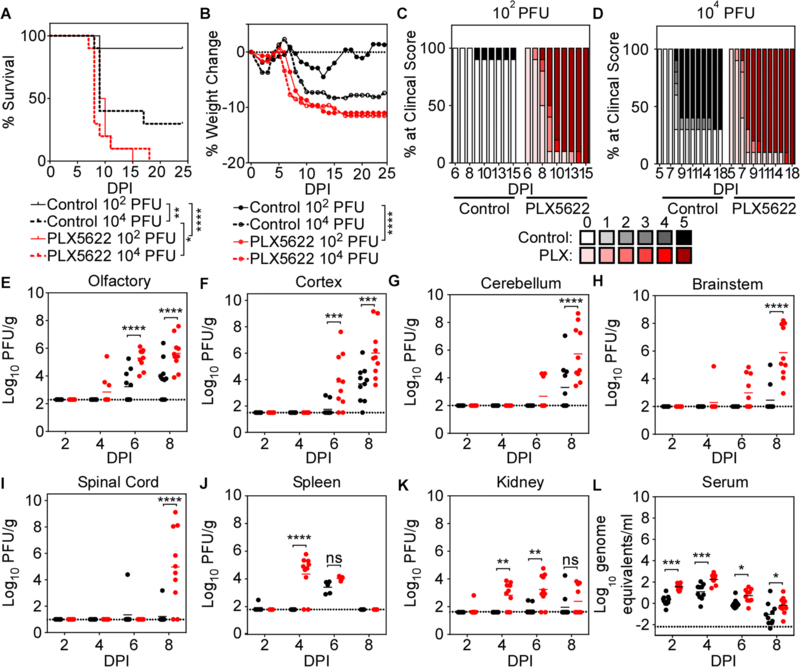 Compared with control-treated animals, PLX5622-treated mice exhibited higher viral titers in the olfactory bulb and cortex at 6 and 8 dpi and in the cerebellum, brainstem, and spinal cord at 8 dpi; however, viral titers were also significantly higher in peripheral tissues of PLX5622-treated mice including the spleen at 4 dpi (Fig. 2j), kidney at 4 and 6 dpi (Fig. 2k), and serum at 2, 4, 6, and 8 dpi (Fig. 2l). PLX5622 treatment did not cause increased BBB permeability in infected mice (Additional file 5). Once WNV-NY enters the CNS via intracranial (i.c.) inoculation, PLX5622 treatment did not affect neuronal permissivity to infection (Additional file 6). 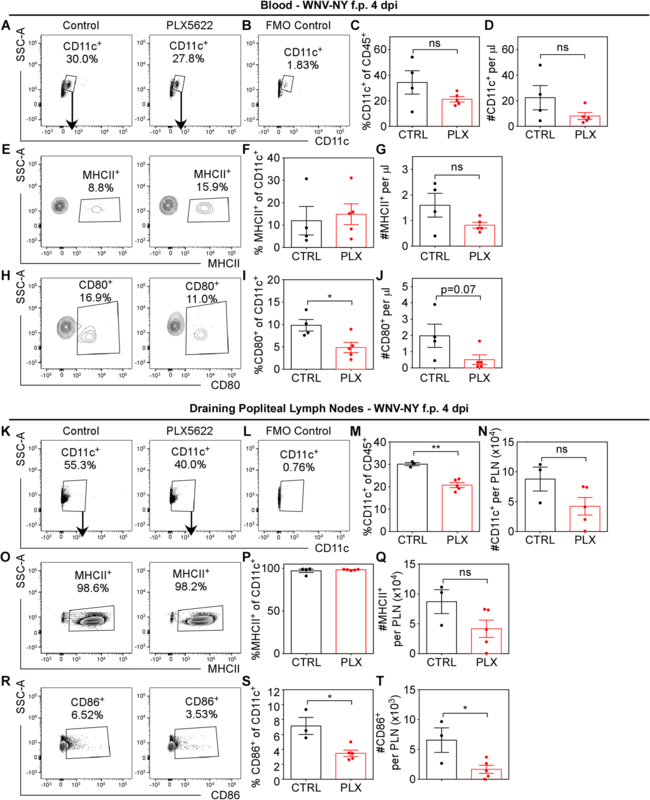 Together, these data indicate a loss of immune-mediated virologic control in both peripheral and CNS tissues in CSF1R antagonist-treated mice, consistent with prior data suggesting that CSF1R signaling plays important roles in the function of both peripheral and CNS myeloid cells [50–52]. To determine whether microglia depletion impacts innate immune mechanisms of virologic control specifically within the CNS, mice were fed control or PLX5622-embedded chow for 2 weeks, then i.c. infected with an attenuated strain of WNV (WNV-NS5-E218A) at 104 PFU. The NS5-E218A point mutation abolishes 2′-O-methyltransferase activity, which functions to methylate the 5′ cap of viral RNA and facilitate escape of IFN-induced proteins with tetratricopeptide repeats (IFIT)-mediated suppression; thus, this attenuation limits viral replication by increasing sensitivity of the virus to type I IFN-mediated innate immune mechanisms [45, 49]. Despite this attenuation, mice treated with PLX5622 were significantly more susceptible to lethal WNV-NS5-E218A infection than those receiving control chow (Fig. 3a). Weight loss was also significantly increased in PLX5622-treated mice (Fig. 3b). Consistent with this, viral titers measured by plaque assay at 2, 4, 6, and 8 dpi in the olfactory bulb (Fig. 3d), cortex (Fig. 3e), cerebellum (Fig. 3f), brainstem (Fig. 3g), and spinal cord (Fig. 3h) were significantly higher in PLX5622-treated compared in control-treated mice infected with WNV-NS5-E218A. As virus was inoculated into the cortex, it was detected there at 2 dpi, followed by spread to the olfactory bulb by 4 dpi, and cerebellum, brainstem, and spinal cord by 6 dpi. PLX5622 treatment also led to decreased proinflammatory cytokine expression in the cortex at 8 dpi (Fig. 3c) and increased neuronal apoptosis in the hippocampus and cerebellum at 6 dpi (Fig. 3l–p) after i.c. infection with WNV-NS5-E218A. As expected, WNV-NS5-E218A was barely detected in the kidney (Fig. 3j), and the virus was steadily cleared from the serum (Fig. 3k) in both control- and PLX5622-treated mice. However, significantly higher levels of virus were detected in the spleen of PLX5622- versus control-treated, WNV-NS5-E218A-infected mice at 4 dpi (Fig. 3i), which was consistent with data obtained during f.p. infection with WNV-NY. Overall, CSF1R antagonism leads to enhanced mortality and loss of virologic control in both the periphery and CNS regardless of the WNV strain utilized, suggesting a critical role for this molecule in antiviral immunity. To determine whether alterations in APC populations impact antiviral immune responses, control- and PLX5622-treated mice were infected via f.p. with WNV-NY (100 PFU). After f.p. infection, WNV-infected cells traffic to draining popliteal lymph nodes (pLN) and stimulate an antiviral immune response . At 4 dpi, a time-point of high serum viral loads (Fig. 2l), flow cytometric assessment revealed a trend towards decreased CD11c+CD45+ cells in the blood (Fig. 4a–d) and significantly reduced percentages and total numbers of CD11c+CD45+ cells in the pLN of PLX5622-treated compared with control-treated mice (Fig. 4k–n). There was no difference in numbers or percentages of MHCII+CD11c+CD45+ cells in either blood or pLN (Fig. 4e–g, o–q); however, the percentages of CD11c+CD45+ cells in the blood positive for co-stimulatory molecule CD80+ was significantly decreased in PLX5622- versus control-treated mice (Fig. 4h–j). In the pLN, the numbers and percentages of CD11c+CD45+ cells positive for co-stimulatory molecule CD86 were significantly reduced in PLX5622-treated mice compared with control mice (Fig. 4r–t). The impact of CSF1R antagonism on CD80 and CD86 expression appears to be tissue-dependent as the blood showed no difference in APCs expressing CD86 and the pLN showed no difference in APCs expressing CD80 (Additional file 7). Together, these data indicate that CSF1R antagonism decreases the expression of co-stimulatory B7 molecules on peripheral APC populations. Because infectious virus was detected in the spleens of mice infected i.c. with WNV-NS5-E218A (Fig. 3i), splenic APCs were analyzed using flow cytometry at 8 dpi. Results indicated no significant difference in the numbers or percentages of MHCII+CD11c+CD45+ cells in the spleens of PLX5622-treated mice compared with control-treated mice (Fig. 5a–c). However, splenic APCs collected from PLX5622-treated mice exhibited significantly reduced populations of cells expressing co-stimulatory molecules CD80 (Fig. 5d–f) and CD86 (Fig. 5g–i) compared with control-treated mice. Furthermore, splenic MHCII+CD11c+CD45+ cells showed significant reduction in the expression level of CD86 (Fig. 5l, m) and non-significant reduction of CD80 (Fig. 5j, k) in PLX5622-treated compared with control-treated mice. This correlated with a small, but significant increase in the numbers of CD4+ and CD8+ T cells, but no difference in numbers or percentages of WNV-specific NS4B tetramer staining or CD69 positivity in spleens of PLX5622-treated mice compared with control-treated mice infected i.c. with WNV-NS5-E218A (Additional file 8). Together, these data indicate that CSF1R antagonism reduces the activation of inflammatory responses in peripheral APCs even without significant depletion. Microglia are hypothesized to act as immediate responders to CNS pathogens as resident APCs that coordinate intra-parenchymal adaptive immune response . Previous studies indicated that clearance of WNV in the CNS requires antiviral CD8+ T cells [19, 32, 55], and that microglia, astrocytes, and neurons express chemokines that attract mononuclear cells to the CNS [21, 56, 57]. To determine the impact of CSF1R antagonism on recruitment of these cells to the CNS, leukocytes isolated from the cortices of WNV-NS5-E218A-infected mice were assessed by flow cytometry at 8 dpi. As expected, CD45loCD11b+ (P1) population, which is primarily microglia , remained significantly depleted in the PLX5622-treated compared with control-treated mice (Fig. 6a–c). The population of CD45hiCD11b+ (P2), which is primarily infiltrating monocytes/macrophages , were non-significantly reduced in the PLX5622-treated compared with control-treated mice. However, the number of CD45hiCD11bneg (P3) lymphocyte population  were non-significantly elevated in PLX5622-treated compared with control mice, though the percentage of this population was significantly elevated (Fig. 6a–c). This increase was largely due to elevated numbers of CD8+ T cell infiltration in PLX5622-treated mice (Fig. 6d–f). Though there was no significant difference in the percentage of CD8+ T cells specific for the WNV immunodominant peptide between PLX5622 and control-treated mice, there were significantly more WNV-specific CD8+ T cells isolated from PLX5622 compared with control-treated cortex (Fig. 6g–i). Despite the increased infiltration of WNV-specific CD8+ T cells in PLX5622-treated mice, the percentages of cells expressing early activation marker CD69 and their level of expression were significantly reduced in PLX5622-treated compared with control-treated mice (Fig. 6j–m). Additionally, the percentage of WNV-specific CD8+ T cells positive for CD160 as well as the level of CD160 expression, which is specifically expressed on highly activated CD8+ T cells , were reduced in PLX5622-treated compared with control-treated mice. However, the numbers of NS4B+CD8+ cells positive for either CD69 or CD160 were non-significantly elevated in PLX5622-treated compared with control-treated cortices (Fig. 6l, p) due to the increased numbers of NS4B+CD8+ cells. Because numbers of infiltrating WNV-specific CD8+ T cells derived from the CNS of PLX5622-treated animals were increased, we hypothesized that their lack of local reactivation may be the result of loss of co-stimulatory signals and/or inflammatory cytokines (Fig. 3c) in the CNS. In order to distinguish resident microglia from infiltrating monocytes/macrophages, CNS myeloid cells were examined for expression of the microglia-specific marker P2RY12 (Fig. 7a). Infiltrating monocytes/macrophages were then identified via gating of P2RY12negCD11b+ cells (Fig. 7b). Populations of both CNS-derived P2RY12+CD45+ microglia (P1, Fig. 7a) and CD11b+P2RY12negCD45+ monocytes/macrophages (P2, Fig. 7b) were reduced in PLX5622-treated compared with control-treated mice (Fig. 7i, j). While no differences in the overall number of cells expressing MHCII were observed in P2RY12+CD45+, a significant reduction of MHCII+CD11b+P2RY12negCD45+ was seen (Fig. 7c, d, l). This corresponded with a relative increase in the percentage of MHCII+ cells in both P2RY12+CD45+ and CD11b+P2RY12negCD45+ populations due to the decreased numbers of total P2RY12+CD45+ and CD11b+P2RY12negCD45+ cells in the cortices of PLX5622-treated mice compared with control-treated mice (Fig. 7k). However, the numbers of P2RY12+CD45+ cells expressing B7 co-stimulatory signals CD80 and CD86 were significantly reduced in the CNS of PLX5622-treated mice compared with control-treated animals (Fig. 7e–h, m–p). The percentage of remaining P2RY12+CD45+ cells expressing CD80 or CD86 were not reduced (Fig. 7m, o); however, the percentage of remaining CD11b+P2RY12negCD45+ cells expressing CD86 was significantly reduced (Fig. 7o), similar to results seen in peripheral APCs (Figs. 4, 5) Together, these data suggest that resident microglia and infiltrating macrophages are important sources of CD80 and CD86 in the CNS, and PLX5622 treatment depletes these cellular sources of co-stimulatory molecules. Recent studies have reported increased viral titers in the CNS of mice treated with CSF1R antagonists [36, 60, 61]; however, the mechanisms underlying this loss of virologic control and the effects on peripheral immune responses have not been well characterized. We sought to determine the role of CSF1R signaling in viral clearance of both systemic and neurotropic infection. Our results indicate that antagonism of CSF1R signaling limits virologic control within the CNS via reduction of critical APCs that express co-stimulatory B7 molecules, CD80 and CD86, necessary for local reactivation of antiviral CD8+ T cells. Our data also indicate that CSF1R antagonism reduces expression of co-stimulatory B7 molecules on peripheral APCs, contributing to loss of virologic control in the periphery and dissemination of virus to the CNS. As previously reported, WNV-NY inoculated into mice via f.p. is detected first within the olfactory bulb then spreads caudally through the cerebral cortex to the brain stem with significant virus not detected in the cerebellum until 8 dpi . CSF1R antagonism with PLX5622 leads to increased viral replication within each of these CNS regions and also in the peripheral organs: the spleen, kidney, and serum. In contrast to CNS titers, the virus is cleared from the spleen and serum by 8 dpi in WNV-infected, control, and PLX5622-treated mice. Notably, we detected expansion of viral tropism with significant viral replication in the kidney of PLX5622-treated mice at 4 and 6 dpi compared with control-treated animals. 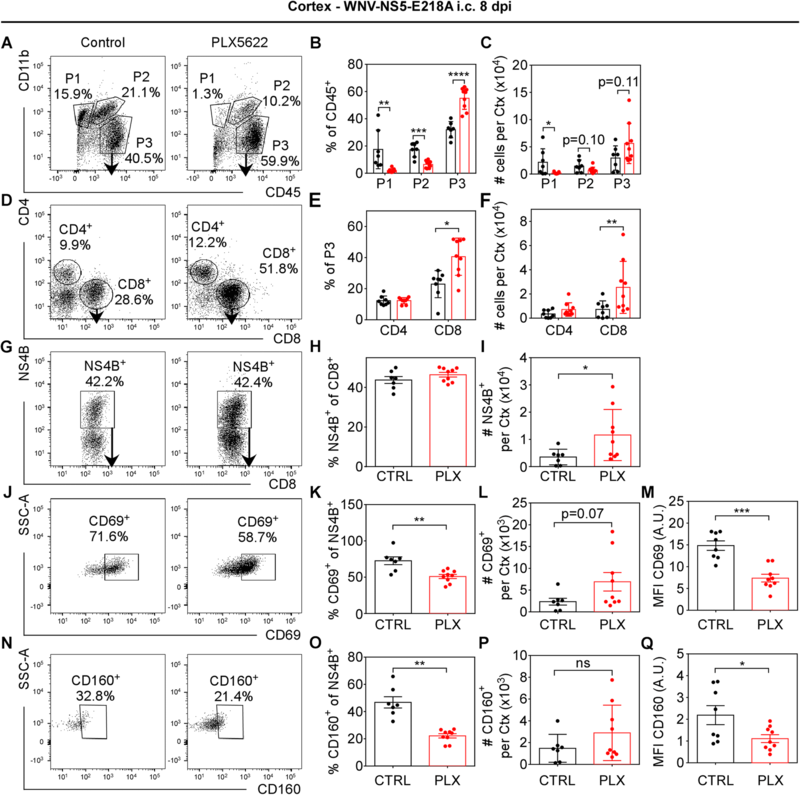 These data suggest that renal macrophages may be sensitive to CSF1R antagonism, which is consistent with a study utilizing a model of recovery from acute kidney injury in which CSF1R inhibition with GW2580 reportedly decreased both kidney macrophage proliferation and their polarization towards wound-healing phenotypes . In order to better isolate the role of microglia during neurotropic infection, we examined the effect of PLX5622 in an established murine model of CNS infection using an attenuated strain of WNV (WNV-NS5-E218A), which lacks 2′-O-methyltransferase activity, thus increasing sensitivity to IFIT-mediated suppression and limiting virulence in peripheral organs with intact immunity [8, 45, 49]. Mice infected i.c. with WNV-NS5-E218A exhibited increased viral titers in the CNS and increased lethality with PLX5622 treatment compared with control treatment. These data suggest that loss of CNS immunity increases lethality of WNV infection. 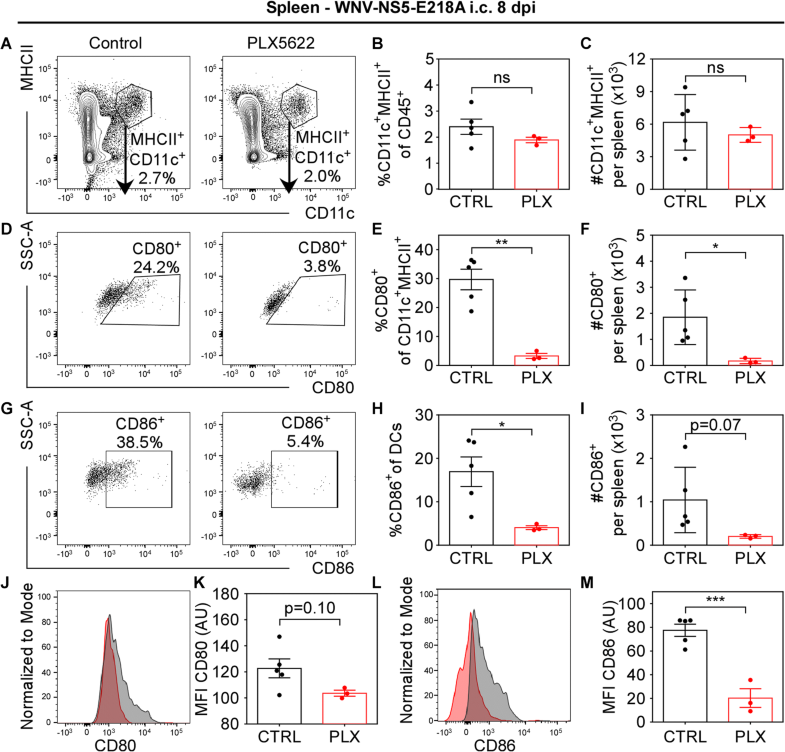 Clearance of WNV within the CNS requires local reactivation of antiviral CD8+ T cells for efficient T cell-mediated adaptive immune responses [55, 63]. Under homeostatic conditions, microglia express very low levels of co-stimulatory B7 molecules (CD80/CD86); however, microglia upregulate expression of these molecules in response to inflammatory cytokines [54, 64]. Our results show PLX5622 treatment decreased expression of these molecules by depleting their cellular sources in the CNS, which include both resident microglia and infiltrating monocytes/macrophages. In the periphery, PLX5622 also reduced cellular expression of B7 molecules on splenic, blood, and pLN APCs. Under certain conditions, other co-stimulatory molecules are able to compensate for the loss of B7 signals in T cell reactivation. For example, expansion of lymphocytic choriomeningitis virus-specific antiviral T cells can be driven by either alternative co-stimulatory TNFR superfamily members or by enhanced expression of antiviral cytokines, such as high levels of type I IFNs . However, during WNV encephalitis, PLX5622 treatment also significantly decreased transcriptional expression of both TNF and IFNβ. Together, our results indicate that CSF1R antagonism contributes impaired local reactivation of antiviral T cells within the CNS by depleting co-stimulatory signals including both B7 molecules and inflammatory cytokines. In addition to augmenting antiviral T cell activation, many cytokines have essential protective roles during WNV infection. 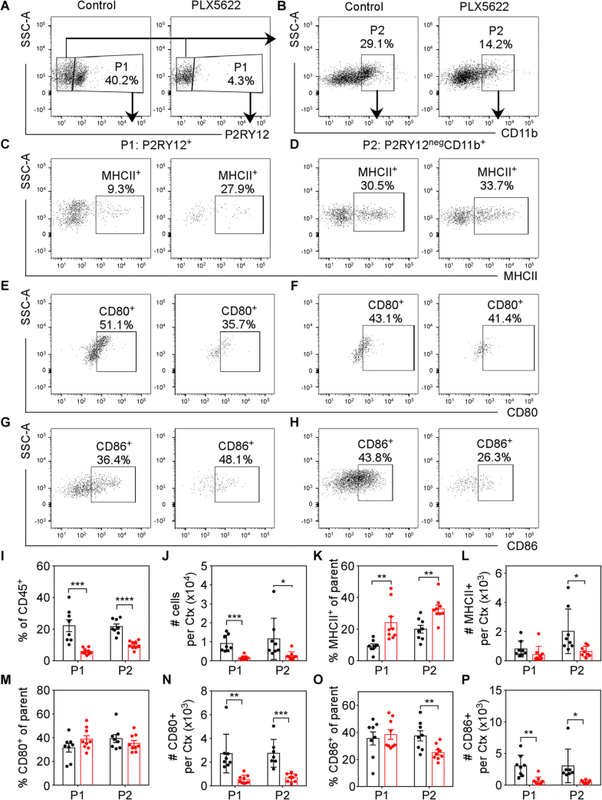 Infected human monocyte-derived macrophages release IL-8, IFNα, IFNβ, and TNF [66, 67]. Microglia become activated in response to neurotropic WNV infection and upregulate expression of CXCL10, CXCL1, CCL5, CCL3, CCL2, TNF, and IL-6 . 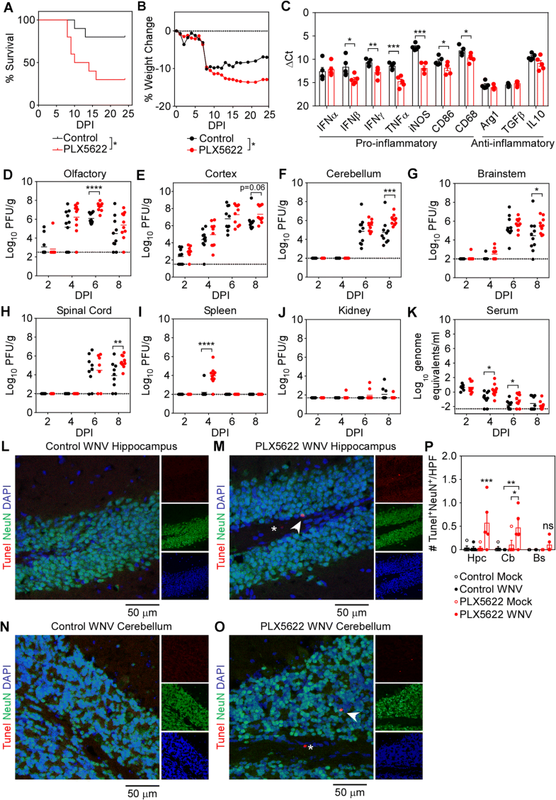 Neurons and astrocytes in WNV-infected brains also release proinflammatory mediators including CCL2, CCL5, CXCL10, IL1β, IL-6, IL-8, and TNF, which promote lymphocyte trafficking to the CNS [19–21]. In fact, results from a recent study demonstrated that peripheral infection with WNV increased CNS expression of chemokines important for lymphocyte trafficking, including CCL2, CCL7, CXCL9, and CXCL10, in PLX5622-treated mice compared with control-treated mice . Type I IFN response is widely accepted as the most immediate antiviral host response, essential for controlling viral replication during the initial infection. Mice lacking type I IFN signaling are highly vulnerable to uncontrolled WNV replication, exhibiting 100% mortality . Clearance of viral infections, however, requires additional immune response including type II IFN, i.e., IFNγ, which is produced by activated CD8+ T cells. Mice deficient in IFNγ show higher peripheral viral load, increased CNS infection, and increased lethality . Data described here show significantly decreased cytokine expression in PLX5622-treated mice, which may also contribute to the loss of virologic control via the above-described mechanisms. The exact role of microglia during viral infection has been difficult to define because infiltrating monocytes can mask the impact of resident microglia. In a previous report, IL34−/− mice, which have significantly reduced development of microglia, are more susceptible to lethal infection after WNV-NS5-E218A i.c. inoculation . Similar to results reported here, IL34−/− mice exhibited increased neuronal death compared with wildtype controls. In contrast with PLX5622-treated mice, IL34−/− mice exhibited similar levels of viral burden compared with wildtype controls in the brain at 3 and 6 dpi. Numbers of infiltrating monocytes/macrophages and WNV-specific T cells were also similar between IL34−/− and wildtype controls; however, the authors did not investigate antiviral T cell activation in this model . In another model of flavivirus encephalitis, in which suckling mice were infected with dengue virus, depletion of microglia with liposome-encapsulated clodronate resulted in increased viral replication and reduced infiltration of IFNγ+CD8+ T cells . Here, we report no reduction in CD8+ T cell infiltration; however, this difference may be due to the age of mice, virus, and/or method of microglial depletion. Another recent study reported use of PLX5622 in a model of neuroattenuated murine corona virus, mouse hepatitis virus (MHV). Similar to our results, PLX5622 treatment resulted in increased viral replication and lethality. In contrast to our results, PLX5622 treatment reduced expression of MHCII on microglia and macrophages and reduced CD4+ T cell response . While CD4+ T cells can improve CD8+ T cell response, the dependence of CD8+ T cells on CD4+ T cells varies by virus, antigen exposure, tissue environment, and effector sites . In models of MHV encephalitis, control of viral replication requires a collaborative effort between CD4+ and CD8+ T cells . However, when virus replication induces activation of APCs, activation of CD8+ T cells is relatively CD4+ T cell-independent . Recently, chronic activation of innate immune response by microglia is believed to be a major contributor to neurodegenerative conditions . Genetic studies have confirmed the relevance of inflammatory response in common neurodegenerative diseases, such as Alzheimer’s disease and multiple sclerosis, indicating that neuroinflammation is likely implicated in the primary pathogenesis, rather than a secondary response . We and others have reported that microglia impact neurocognitive function by executing complement-mediated synapse elimination [8, 74, 75]. Because of the neurological consequences of microglial activation, researchers have attempted to use CSF1R antagonism to deplete microglia in a variety of models to improve neurological function, including traumatic brain injury [38, 39], brain irradiation , myelin-induced catatonia , experimental autoimmune encephalomyelitis , and Alzheimer’s disease . However, our results indicate that CSF1R antagonism may ultimately be detrimental to brain health due to loss of innate and adaptive immune response in the CNS, as well as decreased peripheral APC activation. Thus, in assessing the benefit of CSF1R antagonism, it will be important to consider the diminished immune response in both the CNS and peripheral immune compartments. This study provides evidence that CSF1R signaling is critically important for cellular immunity during WNV neurotropic infection. Pharmacologic antagonism of CSF1R signaling limits expression of co-stimulatory signals through depletion of CNS cellular sources and decreased expression on peripheral APCS. This reduces local restimulation of antiviral CD8+ T cells within the CNS and results in loss of virologic control and increased mortality. These data raise important considerations regarding the use of CSF1R antagonists for the treatment of neurological disorders associated with neuroinflammation. We would like to thank Plexxikon Inc. for supplying PLX5622 compound and Dr. Michael Diamond for access to reagents. This work was supported by National Institutes of Health grants K99 AG053412 to KEF and U19 AI083019, R01 NS052632, and R01 AI101400 to RSK. KEF and RSK designed the experiments. KEF performed experiments and compiled data. KEF and RSK prepared figures, analyzed data, and wrote the manuscript. Both authors read and approved the final manuscript. Preliminary Maps & Data for 2017 | West Nile Virus | CDC. 2018. Available from: https://www.cdc.gov/westnile/statsmaps/preliminarymapsdata2017/index.html. [Cited 2018 Jun 6].